The ancient monuments such as Circus Maximus, Colosseum, Appian Way and of course the Vatican, leave you in awe of the phenomenal concentration of history that you can reach on foot. Not to mention the shopping and the fabulously succulent food! Once again we had been on a cruise (out of Venice) and had deliberately chosen this particular cruise because it ended in our favorite Italian city...whereby we could spend a few days before trudging on home. Civitavecchia is the port for arriving ships and is approximately an hour outside of the city center. We took one of the ship’s excursions that would drop us at the Piazza Popolo area (shown above). DAY ONE started from there where we hailed a taxi to take us to the Hotel Raphael. One cautionary hint…don’t have too many bags, or like us, you will have to wait for a taxi that can accommodate two of you plus the baggage. 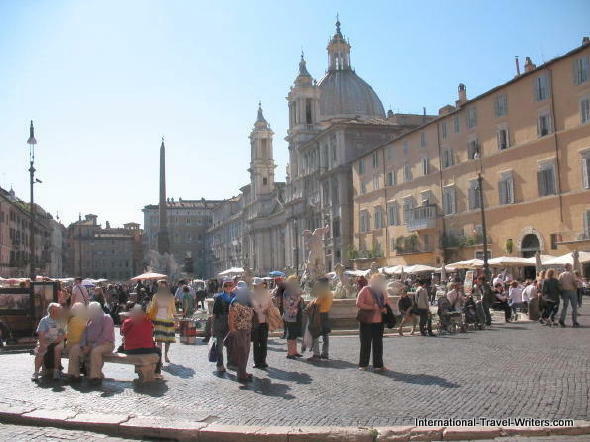 We arrived on the 15th of October and once we had checked into the hotel we opted to re-familiarize ourselves with the area around the hotel which was only one small block from Piazza Navona. Although it was mid October the weather was pleasant with the sun out so we ambled past the Santa Lucia Restaurant (seen above) which was next door to the hotel and although we meant to try it, we didn’t. Guess that will be for the next journey to Rome. 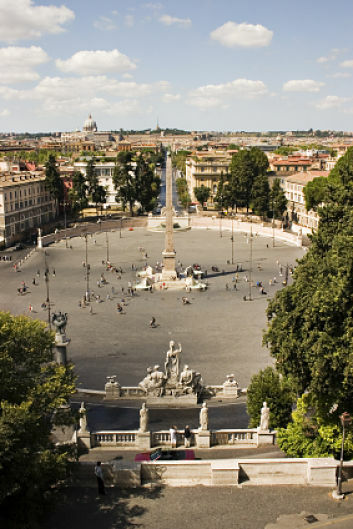 The impressive architecture, majestic piazzas and winding streets demand an unhurried attitude. Similarity, their carefully prepared meals are meant to be eaten slowly and savored. Does it sound like I love the food of Italy??? Piazza Navona is our favorite Piazza in Rome. Bathed in history and vibrant with the festive spirit of both locals and tourists, it is never boring. The artists have their canvases set up and ready to do portraits or caricatures while vendors have scenery paintings and souvenirs they display. One side of the piazza is lined with outdoor cafes where you can sit and people watch while you either dine or have a glass of wine or a cappuccino. We had a glass of wine before we had an artist do a portrait of us...then we continued on our orientation venture heading for the Pantheon and the Trevi Fountain. A hotel staff member had also recommended Trattoria Al Moro for lunch and by the time we walked there we assumed we'd be ravenous. We often wander areas we visit with no destination in order to discover hidden tiny piazzas but this time we had a destination with a special lunch as the reward. Pantheon is from Greek meaning...to every God...commissioned by Marcus Agrippa as a temple to all the gods of ancient Rome and rebuilt by Hadrian about 126 AD. The fountain was added in 1575 and the obelisk followed in 1711. Featured in the film with Tom Hanks called "Angels & Demons" the interior houses the remains of Raphael which attracts tourists from all over the world. However, taking photographs inside is difficult because it is so dark, so be prepared for that. The Piazza del Rotondo is the area in front. It has a fountain where crowds gather for social discourse and other functions while tourists simply watch the activities. There is typically a group of "rent-a-gladiators" available for photographs. A major obelisk is the centerpiece of the fountain. 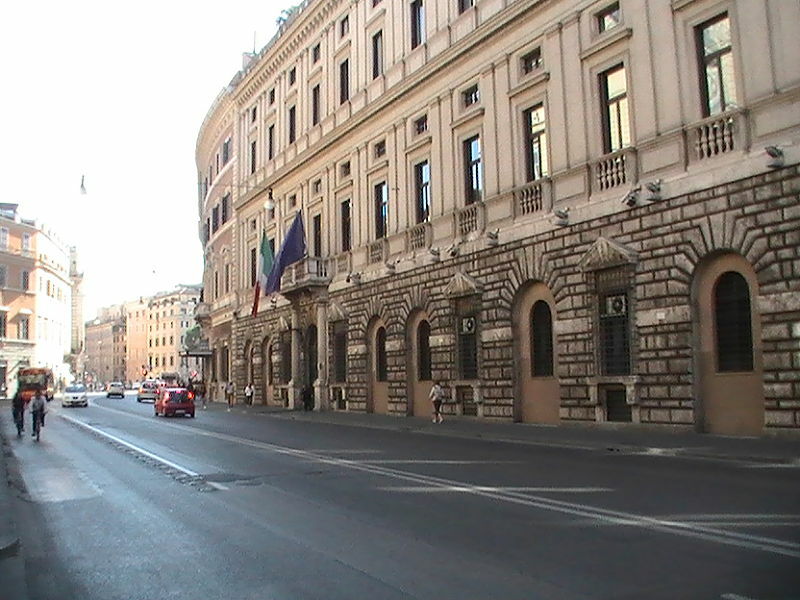 Leaving the Pantheon and heading toward the Via del Corso, a major street of Rome, you will see the Piazza di Montecitorio. This is the seat of the Italian parliaments' Chamber of Deputies. 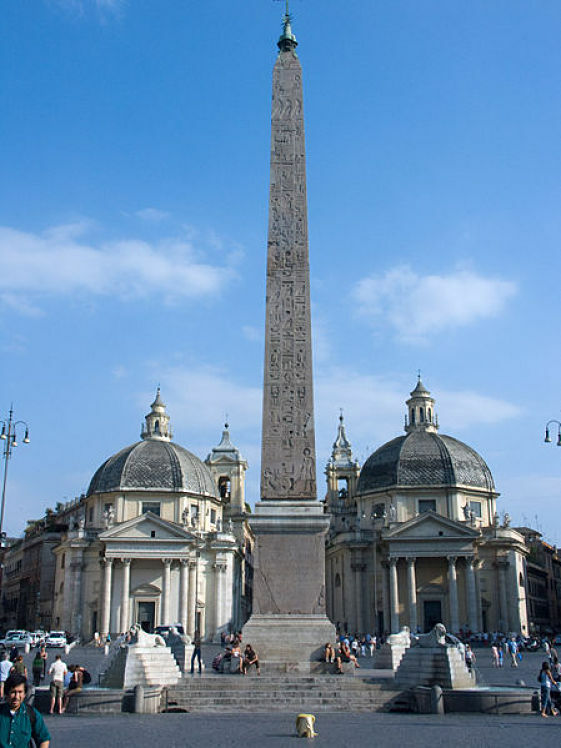 The red granite obelisk is a trophy that Augustus claimed for his victory over Antony and Cleopatra and just beyond is the Piazza Colonna, a 2nd century AD column celebrating the military prowess of Marcus Aurelius. We had only been walking for about an hour with short pauses to take photos...then Voila! 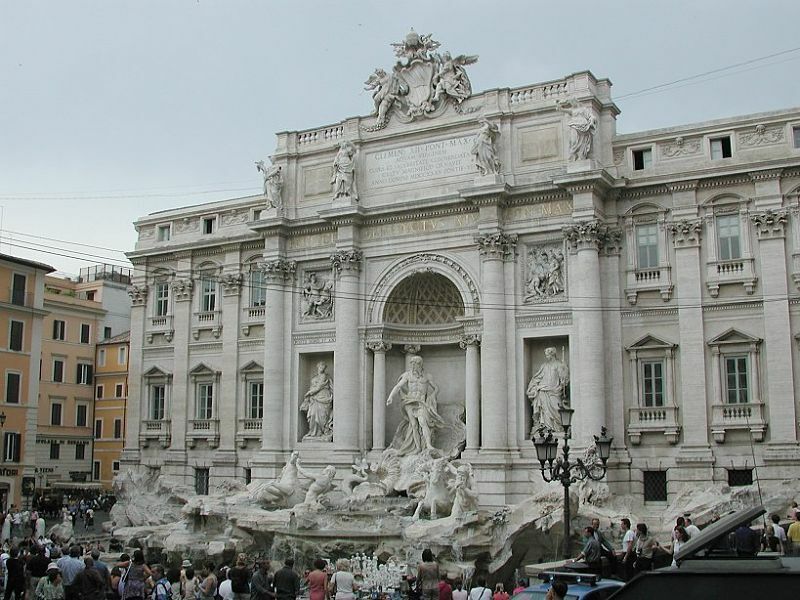 We were at the all famous Trevi Fountain (seen above). We took our photos, watched teenagers texting or holding their cell phones up to snap a picture, and enjoyed the ambiance of an active crowd displaying appreciation for this landmark. Having worked up an appetite and salivating at the thought of a wonderful plate of spaghetti al moro at the Trattoria Al Moro (upon the recommendation of our hotel staff) that's where we went. It was back towards the Pantheon which kept us on the path back to our hotel. Apparently this dish is similar to spaghetti alla carbonara but with different cheeses and a couple of other variations. We enjoyed our late afternoon lunch with an accompanying good local wine, then started our short trek back to our hotel. 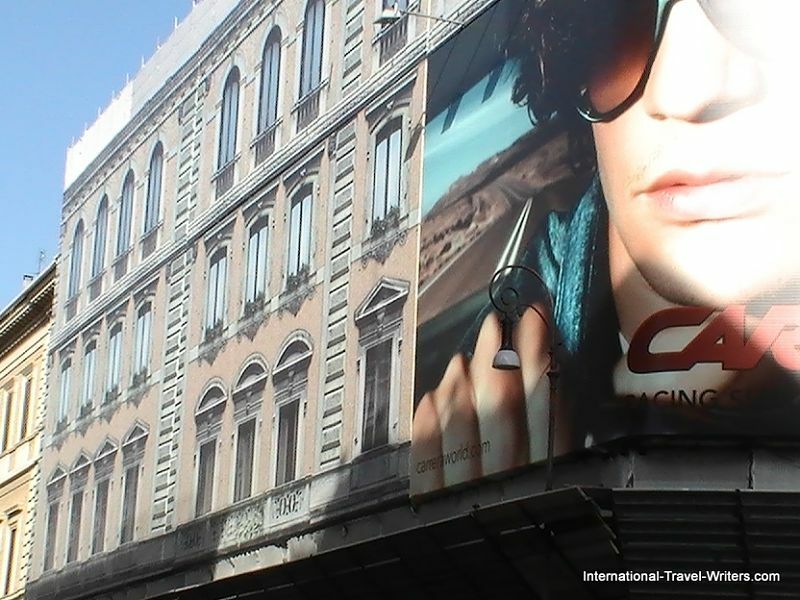 However, if you choose to continue along the Via del Corso you can look in shop windows and once you've turned right onto Via Condotti you can gaze into windows at such renowned Italian brands such as Gucci until you get to the legendary Spanish Steps. 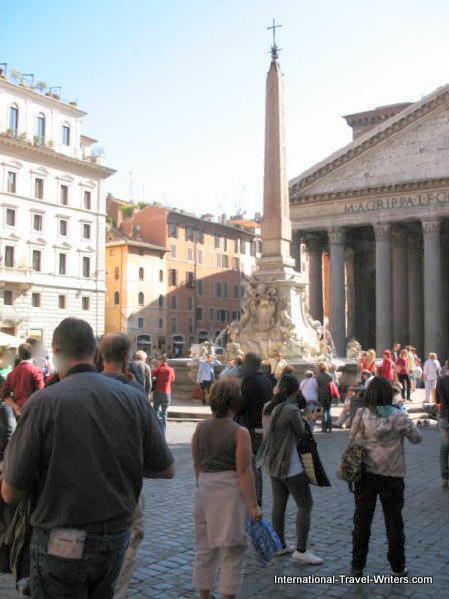 Then you end up at the Piazza di Spagna with its many art galleries. If you keep hoofing it another 15 minutes you'll be at the Piazza Del Popolo (seen above)where we caught our taxi earlier. During our walk we were amazed to see the huge banner facade shielding renovation work on one of the buildings. It looked like real office building windows (shown above). During our walks in the center of Rome we noticed that this was not uncommon. The temperature was cooling and as we meandered back to the hotel to check our email, then have a late dinner. We saw police on horseback. 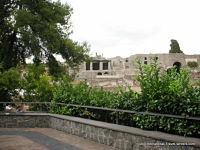 It seemed a little odd compared to our recollections of the area on our previous visit to Rome. 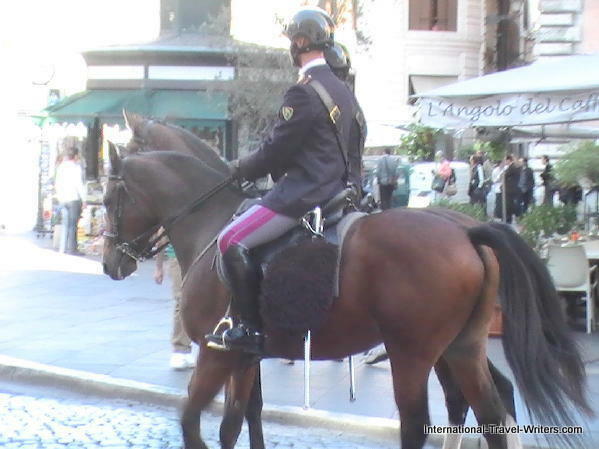 They were patrolling watchfully while mounted on magnificent horses whose hoofs clattered against the cobblestones. We didn't think much more about it until later that night. After a fabulous dinner we returned to our room and put on the TV in the room. The news was showing rioting in Rome, not far from the Colosseum, and even cars were burning. Similar to our "Occupy Wall Street" demonstrations, but not as controlled, crowds were rebelling against austerity measures that were being implemented. The next day at noon we were scheduled for a tour of the Colosseum including the Hypogeum (underground area) and we were concerned that the riots would have the area cordoned off. However, the next morning, although there was still a residual of rioting it was under control and it was business as usual at the Colosseum. DAY TWO started with a superb early breakfast at the hotel. 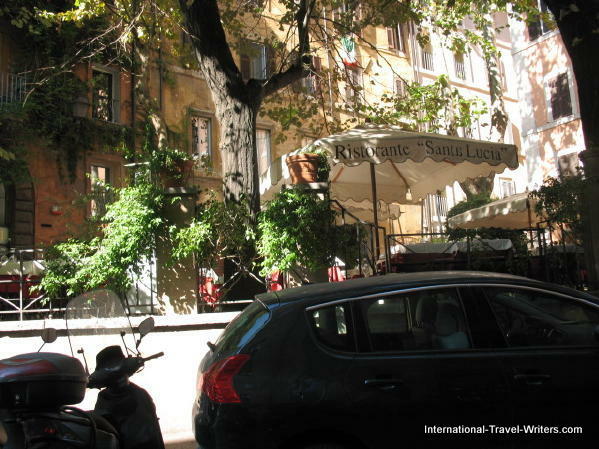 The hotel is centrally located within walking distance to almost all of the main historic sites in Rome so we were going to walk to the Colosseum. I had changed some US Dollars for Euros at a Money Change shop near the Pantheon the day before only because the banks were closed. I was aware the Money Change outlets were notorious for all the fees but we needed tip money for waiters. Rome has a strange custom whereby although you can pay for your meal with a credit card you cannot charge the gratuity. To give an example: the Money Change outlet gave us 50 Euros for $100 US while the bank gave 70. It's a rip-off so be sure to change money in a bank. I knew this but because of the riots this huge bank (seen above) had locked its doors. I tried a few more along the way but they had battened down the hatches. Until the banks re-opened we decided to tip in US dollars...we didn't get any opposition...a tip is a tip. The hotel had made our reservations at the Colosseum and we had instructions to be there at a specific time. We had allowed extra time for the frequent photo opportunities along the way and had been alerted to be wary of the riots which although under control were still in the general vicinity of the Colosseum. 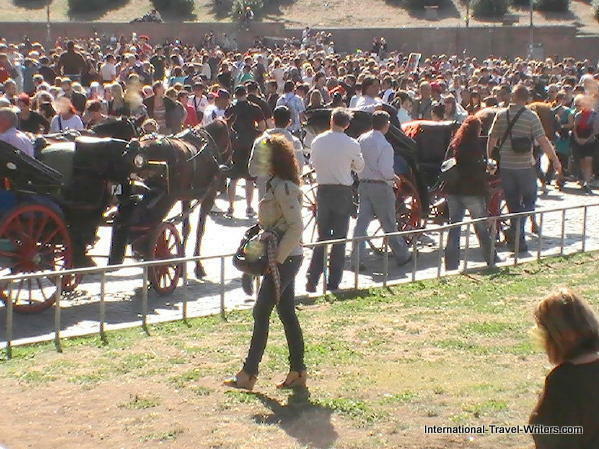 Many of the photos can be viewed on the Walking in Rome page. We arrived at our destination without incident and the details are recounted on the Colosseum page. After several hours seeing all the features of the Colosseum we took a different path back to the hotel so we could view other landmarks of this amazing city called Rome. Dinner is eaten late in many European cities so we ambled back to the Piazza Navona to have a pizza to hold back the hunger pangs until dinner. The waiters are multilingual (sort of) and have a light-hearted humor that makes dining informally a pleasure. After some wine and seafood appetizers we ordered our pizza. The waiter convinced us to have the deluxe pizza which he said had everything on it. He wasn't kidding. Note the poached egg in the middle of the pizza. We should have taken the photo before we made such a mess of the pizza but... what the heck? Another interesting note is that all the eggs that we ate in Rome ... such as for breakfast...were a deep orange. It must be what they feed the chickens because we aren't accustomed to seeing such a deep color in yolks. 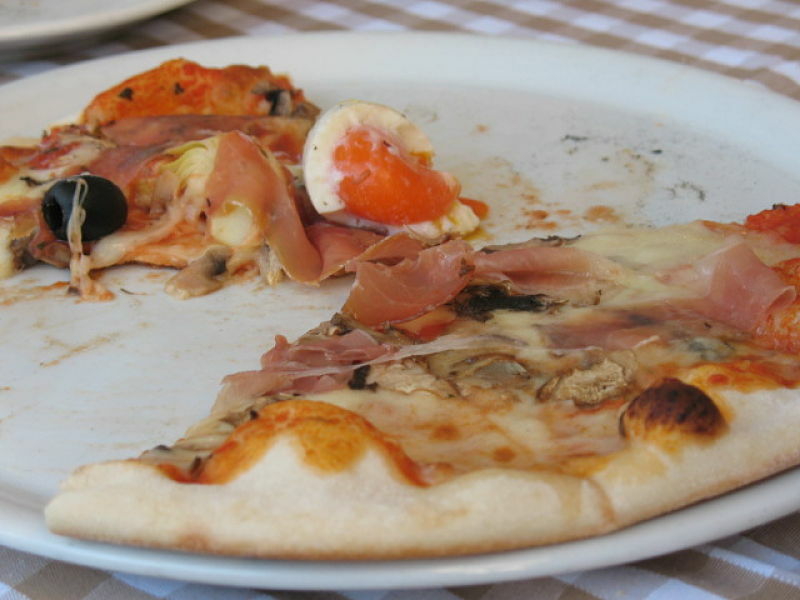 However, the pizza was so yummy that we forgot to take a picture until we had devoured half of it. The rest of the later afternoon was spent back at the hotel checking our photos and email. A nice hot bath and a siesta before dinner fit the bill nicely. We went back to Piazza Navona for dinner and crowd observations. As usual the food was great, the wine flavorful, so it was a great way to end the evening. DAY THREE was the Vatican, St. Peter's Basilica and the Vatican museums that took most of the day. The details are provided when you click on the links. 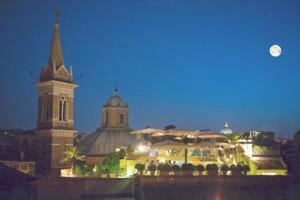 We wound up our evening with dinner at the Bramante Terrace Dining Room atop the Hotel Raphael. 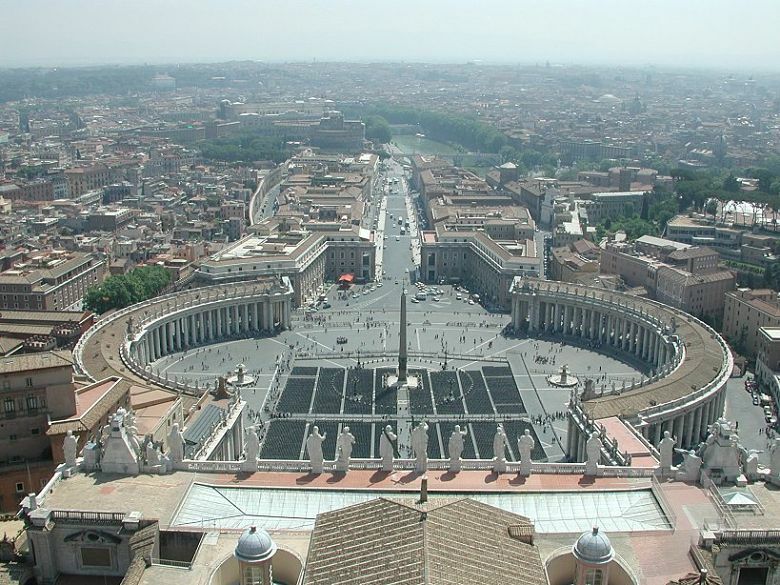 Panoramic views to St. Peter's Basilica were a wonderful backdrop to complement the exquisite dishes and wine. It was the last night that they would be open for the season due to the evenings getting crisp, even chilly. It was the finale of our return to Italy because our flight was leaving very early in the morning and the hotel staff had arranged a private car for us (the same price as a taxi but with a personal touch). Arrivederci Roma! (Until next time). UPDATE: We can't get enough of Rome! We had a another one day stop while on a cruise in September, 2012. Enjoyed walking the city once again and lunch on "The Terrace" at the Hotel Raphael completed the repetition.